Before the age of 21. That’s when most of my story takes place. I began trading the age of 18. Now at 24, I have developed the skill set, and more importantly, the mindset, necessary to trade consistently and profitably. Find out what I’ve learned. I decided to tell my story in the same style that Jack D. Schwager uses in his Market Wizards series. I felt this interview style would be easier to follow. In this case, I am the interviewer and interviewee, but just visualize you’re the interviewer asking the questions. How did you first get introduced to trading? When I was a sophomore in college I came across an ad for a local trading seminar. I suppose it sparked my interest because it was presented as a means of taking control of my financial future. Did you know anything about the stock market prior to this point? I had taken an economics course senior year of high school that I really enjoyed. We touched some stock market basics, but nothing in great detail. I didn’t think much of it at the time because I was already planning to go into architecture at Arizona State. What happened after you went to the seminar? I was immediately hooked. Since I was in college, I was already in a learning mode and from that point on I wanted to learn everything that I could about trading. I picked up Peter Lynch’s book Beating the Street and Alexander Elder’s Trading for a Living. It was my first glimpse at professional money managers and the idea that I could make a career out of trading appealed to me. Where there any other books that you found important early on in your trading? Reminiscences of a Stock Operator, and Rich Dad Poor Dad. Reminiscences for obvious reasons, it’s a classic, Rich Dad Poor Dad on the other hand was a great eye opener to different ways of making money besides just working for a someone. So did you start out as a fundamental or technical trader? I started out as a mix of the two. Each night I would screen my stocks by fundamental criteria, and then turn to the chart patterns. And what were you trading? Stocks. Mostly bigger names in the $20 and up range. I still remember my first trade, RIG. Were you influenced by any traders starting out? Yes, Peter Reznicek aka “Shadowtrader.” I had opened up an account with Thinkorswim and he had a daily squawk box broadcast. I would listen in whenever I could and make notes in my journal. Peter is a huge proponent of market internals and trading discipline. My entire foundation as a trader is pretty much built around those two things. So back to college for a minute, were you studying architecture at the time? Yes, I was in my second year studying architecture at Arizona State, but finding that I was spending more time thinking about trading than architecture. Trading and architecture seem like two extremes, creative vs. analytical. They are in some aspects. I found my mind worked in a much more analytical way and had a hard time with the creativity side of the design. I was taking some business classes too at the time and found they came much easier to me than design. Did you think about switching you major to finance? Yes,, but by this time I was in my junior year and would have had to basically start over and tack on a lot more years of school. I enjoyed architecture, but didn’t have the same kind of passion for it as I did trading. I was always the kind of person to see things through so I stuck with architecture. Well, I moved my focus to more of design management, rather than strictly architecture. In the end, I’m glad I didn’t change my major. Being from Chicago, I had the opportunity to meet a handful of traders, some of which had degrees finance as well as master’s degrees from Princeton. They all said they didn’t use one thing they learned in those classes in their trading. What did studying architecture teach you about trading? Once I started trading I would find myself relating everything to it. In architecture studio you spend a lot of time conceptualizing an idea into a functional entity. Architecture taught me how to think. During presentation reviews a panel of architects and professors would critique your work and spend 30 minutes asking you questions. They wanted to see if you had thought through all of the aspects of your design. In trading, you formulate an idea and develop a trading strategy out of that idea. You have to think about every possible scenario and integrate rules and systems, just as you would in architecture. In trading and in architecture you are designing systems. So when you graduated college did you start trading full-time? When I graduated in 2009, the real estate market was in the toilet and the industry as a whole (including architects) was on a hiring freeze. I figured I had two options, stay in school and get a master’s in architecture and hope that when I got done the market would turn around, or put my architecture career on hold and focus entirely on trading. I chose the latter. At the time you’d only been trading for about 3 years, were you confident enough that you could make a living trading the markets? I was committed to doing whatever it takes. 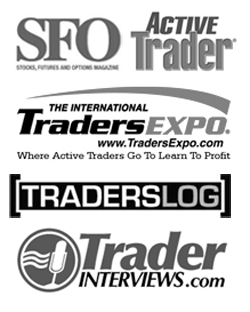 Over the course of those three years I had met some very very successful trader who made their living trading. Some traded on the screen, some in the pits. Getting a chance to get to know them was a really motivating experience. Plus, the techniques I was using were very similar to the ones these big time traders were using; I just had a much smaller account. So when did you start trading full-time? I knew it was important to be able to trade with complete objectivity and that having to make money trading to pay the bills is, in most cases, a recipe for disaster. I got a job as a financial advisor’s assistant after and it was flexible enough to where I could trade and work. Brining in money to pay my bills (which I kept as small as possible) and growing my trading account at the same time. Were you still trading stocks? No I had moved from stocks, to options and was now trading futures. So did you slowly transition out of the employee role? Exactly. It takes a long time to become successful as a trader and I continue to learn each and every day. Just like becoming a doctor or a lawyer, there’s so much time and hard work required up front to master your discipline. Then once you master it, you have to remain disciplined and continue to do your homework each night. I feel I’ve learned quickly, but it’s still taken me 5+ years. Thousands of hours of studying and live trading experience takes place over these early years. The best thing you can do is learn from every situation. Regardless, I seem to find a way to apply anything I learn to trading. Can you describe your trading strategy a bit? I would define it as a retracement strategy. It’s developed from pit traders, but the concepts transfer to the trading screen nicely. Essentially I look to go long at Fibonacci 50% levels (also called halfway back) in an uptrend and short at Fibonacci 50% retracement levels in a down trend. Do you strictly trade intraday? Mostly yes. 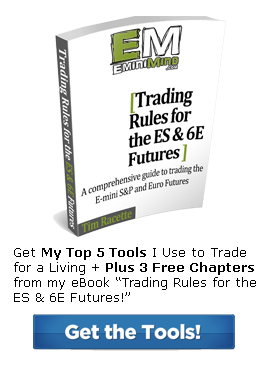 I swing trade options and day trade futures (the E-mini S&P and Euro). I find this to be a great combination. Do you use any indicators? Not in the traditional sense. I use the Fibonacci 50, 61.8 and 1.23 percent lines as well as the NYSE tick and a Heikin Ashi candles chart. Why the Heikin Ashi Candlestick Chart? I find the Heikin Ashi chart to be much easier to spot trend changes because the bars are color coded and relate to the prior bar. It becomes very clear whether we are in a trending market or a sideways market. What time frame are you trading intraday? I look at 15-min charts and 512 tick charts. What advantages does a tick chart have over a time based chart? The tick chart is great because it shows more data and is derived off the number of ticks as opposed to elapsed time. In a fast moving market the tick chart will form bars quickly and in a slow market it will take longer for bars to form. Interesting, are these the only tools you use to trade? For the most part. I like to keep things simple. There are a million and one ways to trade and they can all be effective. Find an indicator or strategy, or develop one yourself. The most important part is that you feel comfortable trading it. It should be a reflection of who you are inside. Why do you choose to share your thoughts on the blog? To me it’s all a part of giving back, just like other traders did for me. The second reason is that writing out my ideas helps me continue to become a better trader. I find the process of writing at length on a particular subject really helps me understand it. Where do you see yourself and the blog going from here? Well trading will always come first, the blog second. Really, it’s up to the readers. I’ve had a lot of people write me asking for things like a live trading room, how to videos, and webinars so I’m entertaining the idea of a members only section for serious traders. Otherwise, I’m happy to offer up any advice or insight that I can. I need to justify the cost of my time, but for the most part everything will remain free or relatively inexpensive such that we keep the community small enough that it attracts only serious traders committed to becoming successful. So you are 24 right now at this moment?? That’s pretty impressive buddy! Anyways..Lots of Trading Gurus say Don’t say ‘I trade because it brings the excitement and Fun’ BUT! I Love it because it really does give me the excitement..Since I started trading business I HATE the word TGIF. I just can’t wait til Monday!! Weekend is just another boring days..
Don’t you feel that way too Tim ? That’s funny Edin, my trading buddies and I always joke and say, “is it Monday yet?” I love it! I think the excitement in trading comes form the unlimited upside potential. Once you’re risk is controlled it becomes an addicting game. yea dude..I am just addicted to it. I just can’t sleep right on Sunday night. I wake up way too early cuz of excitement. Trying to concentrate on Points instead of Money term really helped me a lot. Because as the Contracts gets bigger it really is hard to handle the Big Loss emotionally and thus i find myself not following the Rule. But now I am getting better at it. As you increase contract size it’s VERY important to stay disciplined and take every trade setup that gives you an entry signal, otherwise your statistical set will be skewed. For example. You place a trade and take a stop out. Now you are extra cautious and pass on the next setup that results in a big winner and you’re stuck kicking yourself. Once I had enough statistical live trade data I knew that in doubling my size my outcome would remain the same or better because of the ability to scale out. My biggest setbacks came when I became to confident and let my guard down. Discipline 100% of the time, all the time. oh Hey Tim I got one more Q.
I Trade from 5:30 AM – 11:30 AM PST. (I live in Seattle) Trade Russell / Oil. Let’s say I had to Take the 3.0 Loss in Russell at 9:30 AM. and my account size is $10k. so I lost 3%…Would you Stop Trading if you were me? Or would you Trade until 11:30 AM if you see another set-up? I normally Trade until 11:30am Regardless my P/L. I would trade smaller size. Max 2cts. so you are saying you would trade til 11:30am but you would Decrease the contract size. What if you trade 1 contract?? Would you quit for the day ? I would trade a small enough contract size to where one stop out wouldn’t effect me emotionally and I could trade all valid setups for the day, whichever time frame you chose. Hi Tim, What was your account size when you begun trading futures? what sort of % drawdown did you experience before you became consistent. Hope this does not seem too personal! Hi Chris, after some experimenting and papertrading I allocated $15,000 to my futures trading account. This was just a portion of my trading capital, I wasn’t loading the boat in my futures account as I had already been trading stocks and options for about 3 years before this. My biggest drawdown was about $3,500. This was the result of increasing my contract size at the onset of a streak of losers. I’ve always focused on keeping my risk per trade a small comfortable number (comfortable for me) and limiting myself to 2 full stop outs per day. This I believe is what has helped limit my drawdowns. Once I began to think in terms of groups of trades (i.e. looking at the net sum of my last 20 or 30 trades) I developed more confidence and the ability to take every setup that met my criteria as apposed to picking and choosing which ended up with me taking the losers and passing on some winners which would have made up for the losers and then some. Tim really appriciate your response, i think it gives new traders confidence knowing you dont have to start trading futures with a $30,000 + account and consistancy can be achieved with good discipline. I have a $20,000 account and trade the emini dow, sometimes i worry if this is enough so thanks this has helped alot. Ya I mean there are so many factors that play into it, albeit directly or indirectly. I added to my account over the years as I increased my contract size, but then I stopped looking at my statements all together and focused more on my last 20-30 trades in terms of net ticks/pips. In a lot of ways keeping it simple, but still going through that nightly routine kept me focused and “in tune” with the markets. I still continue to simplify still, but the core of my confidence comes from reviewing the markets each night and identifying my setups, the ones I took, the ones I didn’t, the ones that in hindsight seem so clear. Just like a sprinter training for months before a 10 second race. If you’re committed, all those Fri and Sat nights at home reviewing trades and going through stats pay off. A lot of work on the front end, but keeping your eye on the bigger picture really has lead me to an enjoyable life thus far. First, thanks for the great blog. I have been devouring your content recently. After a month of paper trading, I am planning on trading one Euro contract 3-6AM (east coast) Tuesday-Thursday. But, I’m not sure if that little screen time will skew my odds. Any advice specific to this situation? Hopefully, not “don’t do it”, lol. Hi Dan, I think it’s important to focus on a certain time frame and trade it each day. This way you develop that ‘feel’ or intuition that does play a role in the confidence and ability to execute orders effectively.